In the tough automobile industry the Battle is definately over for Rover. A small area of the Longbridge factory soon to be used by Chinese Nanjing who bought the bancrupcy estate. They will build MG:s here. The productionline and other facilities are moved to a new factury in China. The two last Rover-models, the 25 and the 75, are owned by Chinese Shanghai, but they are not allowed to use the name Rover. Land Rover and Range Rover are owned by Ford. In September 2006 Ford used their option to by the Roverbrand from BMW. So what can we Rovernuts expect in the near future? No Rover saloons for sure! The brand-owner Ford is in trouble and will certainly not have money enough to start building Rovercars. Ford will go on with Land Rover and Range Rover until they can find a buyer. Shanghai will develope and build the last genuine Rover, the 75, in China. They will most certainly export it, maybe even to Europe and the US. But the cars will need a new brand. Nanjing will continue with MG. They will build them in China, and use assemblyplants in Longbridge, UK, and in Oklahoma, USA. Nanjing also owns a few other legendary brands like Austin. Most likely Nanjing and Shangahi will cooperate. Together they might decide to use one brand like Austin. Shangahi devels the bigger saloons and Nanjing the smaller model. The best we rovernuts can hope for is that someone with too much money buys Land Rover along with the Roverbrand from Ford, and that he decides to start building Rover saloons again. But let's not hope too much . . . The last Rover from Longbridge! On Friday July 28th the last Rover was built at Longridge, and the last 54 car makers were made redundant. This was the final end och more then 100 years of carmanufacturing at Longbridge. Ever since the administrators took control over MG Rover Group on April 8th car manufacturing has continued at the factory. The aim has been to complkete all the unfinished cars. It has been both MG:s and Rovers and of all models. Teher are still more then 200 persons working for MG Rover Group. They are selling the last cars, working with finance, human resources and IT, and they will stay until the new owner gains control. During June and July Honda has removed vital blueprints and equipment from Longbrigde. They have removed everything that is vital for the production of Rover 45 and MG ZS, models based on the old Rover 400 which was developed through a joint venture between Honda and Rover in the 1980-ies. The model was jointly owned by Honda and Rover and Honda refuses to let it come in the hands of any other company. Nanjing Automobile Group Corporation, founded in 1947 and China's oldest carmanufacturer, won the battle about the buncrupt MG Rover Group. On July 22nd the deal was signed. Most likely this will mark the end of the Rover brand! No sum has been revealed but Nanjing has paid more then £50 and les then £100 milion for the complete MG Rover Group, including Powertrain. Nanjing plans to continue making the MG-range of sportscars in Longbridge and the MG ZT at Longbridge or at some other place in the UK. They also plan to establish a research and developement centre there. The aim is to engage up to 2 000 persons within five years, and to introduce at least five new MG-models in the same time. Production of small and mediumsized cars will be moved to China as well as Powertrain. We will see many new MG:s soon. The British consultancy Arup, has been drawning on some, left, for Nanjing. Arup worked with MG Rover when the MG sedans were developed, and they will continue working with Nanjing. MG Rover Group owns a lot of brands besides MG and Rover. Sources within Nanjing reveals that cars built in China will be branded as Austin, which still has a good reputation in Asia. By doing so they avoid problems with Shanghai Automotive Industries Corporation, SAIC, that has the rights for Rover 25 and 75. This probably marks the end for Rover as a brand on new cars, if not BMW pops up with something new! Rover has been building cars during 101 years. This epoque came to a halt on Friday April 15th 2005 as The MG Rover Group was put in bankruptcy. One week earlier production stopped at the Longbridge factory as suppliers stopped delivering needed parts. They had not recieved payment for a long time. On Friday April the 8th, recievers took control over the company and during one week they tried every possible way to get MG Rover Group back in business with no succeess. The recievers declared bankruptcy on Friday April 15th and what remains is to sell what ever is left of value in the company. The 6 000 workers were dismissed, and the closure of MG Rover is expected to cost another 12 000 workers at suppliers their jobs too. One thousand workers will be engaged a short time to finish about 1 000 cars at Longbridge. When Phoenix Venture Holdings bought MG Rover Group from BMW in 2000 they concentrated all production to the Austinfactory at Longbridge. This factory was built by legendary Lord Herbert Austin in 1905. The centenary would have been celebrated in many ways during the summer 2005. 30 years of woe! from The Times. The same story the BBC way. They are guilty! from The Independent. Jeremy Clarkson is not shedding a tear for Rover. for Rover. Read this at your own risk! Big sale in Europe, but Sweden is lacking cars! In Sweden it has been difficult to get the Rover you want for some time. In fact no new cars has been deliviered from the UK since the turn of the year 2004/2005. This have had the effect that the last few cars available has been sold at ordinary prices in late april. In UK and in mainland Europe the sales have dropped considerably the last few years and you've been able to by last years cars very cheap. Today every listed price is negotiable - which is very extremely cheap for the buyer! I've heard of thousands of unsold cars on a diisused airfield somewhere in the UK. I'd like a picture of that! In Sweden the sales-agent went into bancruptcy only a few days after the MG Rover Group. The Swedish company did not have funds enough to grant the warranties, and without warranties it's illegal to sell new cars. In Norway the agent choosed to grant the warranties. The Norwegian agent also run the sparepart business for Norway and Sweden. In order to continue the spareparts business they grant the warranties for all cars for three years in Norway and for two years in Sweden. Wednesday April 13th. Brit Automobile, the Swedish sole distributer for MG and Rover cars. A privately owned Swedish company. Monday April 18th. Phoenix Venture Motors, PVM, a group of 11 MG Rover dealers owned by Phoenix Venture Holdings. In 2000 Phoenix Ventures Holdings bought MG Rover Group from BMW for £10. There was another British competitor , Alchemy, that planned to stop building Rovers and go on only with the popular MG sportscars. This would have left thousands of employees without job, and thanks to popular opinion and a little help from the government Phoenix won the battle of MG Rover. BMW kept the newly introduced Mini and sold the Land Rover division to Ford. Phoenix got Rover, MG, the old Mini - with only a few years to live - and Powertrain. Phoenix planned strategic alliances to develope new models. This is a common way to cooperate with competitors and one of few ways of surviving. Phoenix realized this was the one and only way to save most of the jobs within MG Rover and at the many suppliers in the UK. Lacking the profitable Land Rover division and knowing that the Mini only could live a few years the time was running fast and the need of a partner urgent and early in 2002, less then two years after the take-over, Phoenix signed a deal with China Brilliance. Now the future seemed bright! Read more about the first Chinese attempt. This deal failed when one of the leading persons in China Brilliance dissappeared with a great part of the company cash. During the autumn 2002 MG Rover was able to sign another deal that should have helped the company survive while waiting for the final joint venture. This time MG Rover signed a deal with Indian Tata to redesign and rename the small Tata car Indigo. The result, CityRover was aimed to replace the old Mini. But this new small Rover was not at all appreciated by the UK public. In fact it became a burden for MG Rover. Read more about the Indian attempt. MG Rover found another Chinese gem, Shanghai Automotive Industry Company, SAIC. During most of 2004 the negotiations went smoothly and in the autumn a preliminary deal about a joint venture was signed. It was sealed with a seperate deal in which SAIC bought the intellectual rights for Rover 25 and Rover 75 as well as the K-series engines. The only thing that remained was an approval from the SAIC owner, the Chinese government. This approval was expected early in 2005. Read more about this second Chinese attempt. How come that SAIC got 30 per cent in MG Rover Group and 70 per cent in the new joint developing company? How could MG Rover Group sell their two most modern models, the K-series engines and the Rover-badge without a complete and final contract for the whole deal? Despite Rover - British car industry is stronger then ever! During 2004 1.7 million cars were built in the UK, compared to 1.9 million cars in 1970 which is the all time high soo far. During 2004 1.2 million cars were exported from the UK which is all time high. The difference is that the industry today has foreign owners, which indicates that it may lack roots to the genuine British way of designing cars. Teher are seven international companies active in the UK, Toyota, Nissan, Honda, GM, Peugeot, BMW and Ford. All of these, but Ford are profitable. The worst year for British car manufacturing was 1982 with only 900 000 cars built. Since then production has doubled with 50 per cent less employees. Sources: Most of the national British newspapers online, as well as BCC online. 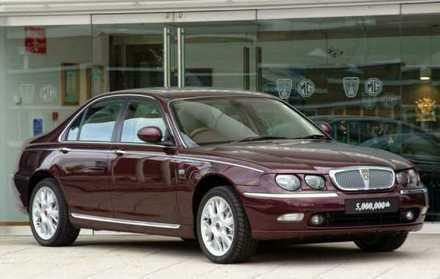 A fully equipped Rover 75 Saloon was the five-millionth car built by the MG Rover Company. It came in a new paint finish, Xirallic Aubergine. The special five-millionth car will be kept by the MG Rover Company and used at special occasions during 2004 when 100 years of car production will be celebrated in many ways. But a number of replicas will be built and sold to the public. They will have the same speecifications as the five-millionth car, and will be sold at a favourable price. For the occacion of building the five-millionth car the MG Rover Company has made a great effort to collect statistics of carproduction. You can see the statistics here. 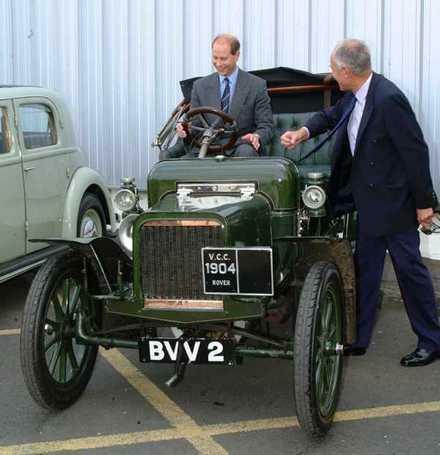 The Earl of Wessex, Prince Edward, sits in one of the first Rover cars, built in 1904. Kent Robinson, owner of this Rover 8hp, explains the characteristics of the car. Since July 2002 MG Rover and the Government of Poland has been involved in discussions about the Daewoo FSO plant in Warsaw and the Daewoo FSO's distribution operations in Poland. The aim from MG Rover was to get a possibility to produce "old" models in eastern Europe and to get a representation in the area in order to develop the groups presence there. It's supposed that MG Rover and the Polish government has signed a Letter of Intent for a MG Rover overtake of the Daewoo enterprises in Poland, but somehow the agreement has not been completed. Rumours in the business say this is due to lack of funds in the MG Rover Group. The Range Rover was born as an idea of the market surveyor Graham Bannock in 1965.